Getting ready to teach a workshop. Practicing on a few private workshops first. Kirk and Josh at Red Rock in Colorado, taping one of the Craftsy.com classes. This one was about Family Photography. 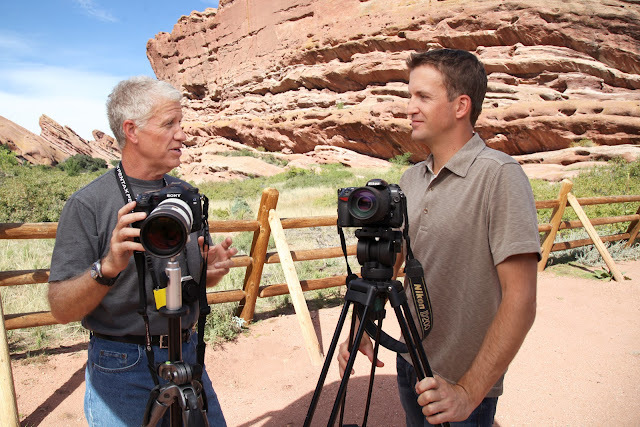 When I worked with Denver based Craftsy.com to create three different online classes about photography I learned a lot more about the best methods to teach technique and photographic concepts. The need to perform for video cameras and to work to a loose script added a bunch of new skills to my teaching knowledge base. I'd taught workshops before but having the cameras there, auditing my every word, made me work harder to hone the expression of the concepts into easily learnable chunks of good information. I wasn't a total newbie at teaching since I'd taught photography classes in the College of Fine Arts at the University of Texas at Austin a number of years ago and have kept my hand in the teaching part of photography with a number of daylong classes that teach very specific lighting and camera skills. But being on the "other side" of the cameras makes you really tighten up the way you convey ideas and information, and reinforces the need to keep your audience engaged. I'm teaching a workshop in Iceland this Fall and I'm already going back and practicing my teaching skills so I can give our students a great experience by delivering a lot of good information, and demonstrations, in the most efficient (and fun) ways. To do this I'm setting up a video camera and microphone and taping myself presenting various teaching segments. Using the video I can see where I become bogged down in an explanation and I can go back and work through it until I can make the concept sticky and learnable. I'm also teaching private, half day workshops for more advanced photographers who want to concentrate on specific parts of their photography that they'd like to improve. I put together four hour modules with theory, demonstrations and then hands-on practice. At the end we look at the results and do a critique. The private, half day workshops are $650 and we fit them around my commercial photography schedule. We're already booked up for all available slots in August so we've stopped taking new students for now; we'll see what September looks like. I'll be doing a "warm-up" event in Marfa, Texas near the end of September and I'll be taking along a couple of models to work with while I'm there. The goal is to get more and more fluid with my teaching. I've long stressed that fluid camera handling comes only with daily practice and, to a certain degree, it's the same with teaching photography. It's nearly impossible to drop in cold and do a great job. Teaching well means planning and testing your methods. I'll have more details to share later but the Marfa event will be a workshop for a very limited number of people. All of this is to get ready for the Iceland workshop on the 27th through the 4th of November. If you are going to photograph with me in Iceland you deserve my best work as an instructor. I'm excited about the trip and have dived into some deep research about all the places we'll visit so I can help everyone get the best possible photos. If you are interested there are still a few slots available. You'll need to get in touch with Craftours to join in the experience. I'm sure we're going to have a blast. Bring some warm clothes, and your favorite cameras and lenses, and lets make incredible photos!